You can't really "discover" a place where people have been living for thousands of years. The Knights of Columbus are the reason Columbus Day was declared a national holiday in 1937 by President Franklin D Roosevelt, because they wanted a day to celebrate Catholic Italian American heritage (Columbus was a Catholic Italian). Hey, I'm down to celebrate Italian Americans. Let's have an Italian Americans Are Great Day and cancel this Columbus bs. 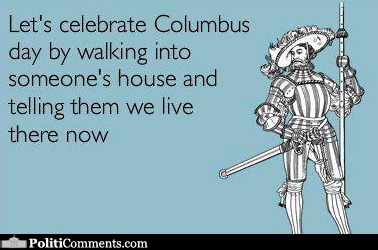 Fortunately, more and more cities are ditching Columbus Day in favor of Indigenous People's Day, which honors Native Americans, whose ancestors settled in the Americas over 15,000 years ago. In the 1990s, Berkeley, CA, was the first city to cancel Columbus Day in favor of Indigenous People's Day. Since then, dozens of cities and even whole states have made the change. Does your city celebrate Indigenous People's Day?